The Clearing is an independent first feature from director Pieter Jan Brugge, but he’s no industry newbie. A producer for Edward Zwick, Alan J. Pakula, and Michael Mann, Brugge has worked in the industry for 15 years. Brugge took his idea to screenwriter Justin Haythe, who developed it with him into a full-fledged script. That they attracted Robert Redford, Willem Dafoe and Helen Mirren suggests they were on to something big. But watching The Clearing, I kept waiting for that moment of genius to flash. The movie shows great competence, but not brilliance. The Clearing is a kidnap movie. Wayne (Robert Redford) is a successful car-rental executive. His wife Eileen (Helen Mirren) raised their children and now enjoys breakfasts by their private pool. The kidnapper is Arthur (Willem Dafoe), who holds a grudge against Wayne from earlier in his career. The movie follows two timelines. One follows Wayne and Arthur hiking through a mountain forest to a remote cabin; the other is Eileen’s response to the ordeal, with her children and a helpful FBI agent moving in to the house. Redford and Dafoe really inhabit their roles, and their interaction is a pleasure to watch. 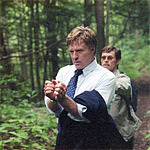 Although Arthur has the gun, Redford’s cool confidence (and his character’s success over Arthur in the past), gives him a psychological edge. Dafoe’s uses his character’s meekness as the starting point for a slightly psychopathic persona that keeps Walter on his toes. The only sparkle of inspiration comes from Jan Brugge’s use of two timelines. Separating husband from wife, he tells the story of the emotional separation in their relationship. They’ve been married so long, their routine so comfortable, that they might as well be roommates instead of spouses. Keeping them apart in this crisis, Jan Brugge lets them each rediscover their love. Jan Brugge also gives himself leeway to let the timelines run at different speeds. So while Wayne and Arthur have a real-time conversation, Eileen speaks with the feds about the procedures for dealing with kidnappers. And Eileen moves on to day two before Wayne and Arthur get half an hour from the car. It’s a subtle trick that demands the audience stay alert. The end of the movie is satisfying, both as a story and emotionally. But watching the movie, I kept waiting for the big twist, the big stylistic expression, or whatever it was that got this movie produced instead of some other worthy script.